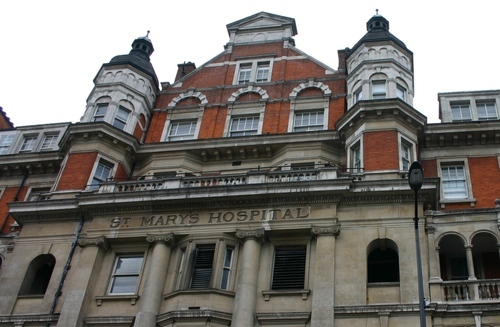 St Mary's Hospital, in Paddington, London, "was founded in 1845 as a voluntary hospital for the benefit of the sick poor. (…) From the beginning, St.Mary's was planned ad a teaching hospital. 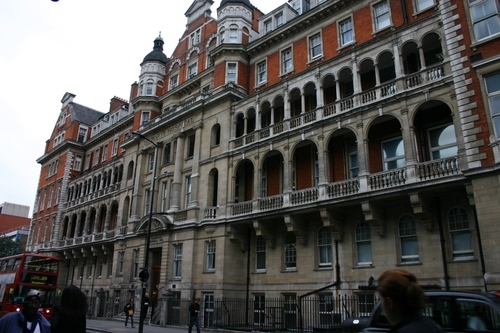 The first two clinical students entered when the Hospital was opened in 1851. A medical school was opened in 1854 and was run by the Hospital until it gaines its independence in 1948"1. "In 1887 Augustus Désiré Waller (1856-1922), lecturer in physiology in the Medical School, discovered the electrical reactions of the human heart at St.Mary's which led to the development the electrocardiograph"2. In the early 20th Century, "St Mary's enjoyed an impressive international reputation through the fame of its Inoculation Department headed by Sir Almroth Wright (1861-1947), who came to St Mary's in 1902 (…). He hoped to cause a revolution in medicine by applying his ideas of vaccine therapy for the cure and prevention of bacterial disease in a general hospital. 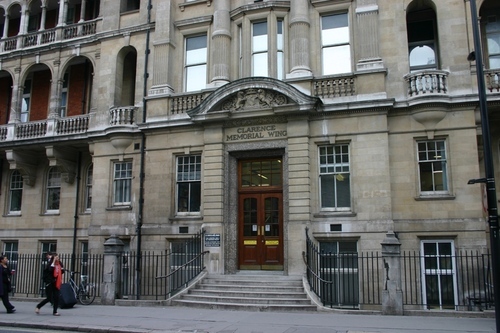 (…) One of the members of Wright's brilliant team was Alexander Fleming (1881-1955), Professor of Bacteriology (1928-1948) who discovered penicillin in his small laboratory in the Clarence Wing in 1928. It was for this discovery that he received the Nobel Prize for Medicine in 1945, jointly with Howard Florey and Ernst Chain, who had refined penicillin for clinical use at Oxford in the early 1940s"3. This discovery revolutionised medicine and there are very few people whose lives have not benefited from it. "Rodney Porter (1917-1985), first Pfizer Professor of Immunology, was the second Nobel Prize winner for Medicine on the staff of St.Mary's. in 1972 for his work on immunoglobulins. He won the Prize in 1972for his work on the development of cellular immunology"4. In the 1980s St Mary's gained recognition as one of the world's leading centres of research into the cause and treatment of AIDS and the nature of the HIV virus"5. 1. Brown 1991, p. 2. 2. Brown 1991, p. 7. 4. Brown 1991, p. 27. 5. From the official website of St Mary's Hospital (February 2008).